Hopefully, the answer was “zero,” but if it wasn’t, I won’t laugh at you. Too much. We’ve all been distracted by our phones at some point or an…wait…ah, nevermind, just got a phone notification reminding me to feed my virtual pet lizard. Where was I? Yes, phones can be distracting. However, distracted walking doesn’t often lead to hilarious outcomes like the above, does it? 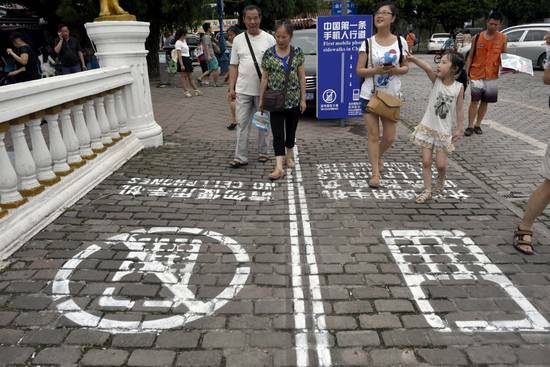 Well, it turns out there’s an epidemic of texting-triggered accidents in China, because the city authorities of Chongqing have introduced a drastic measure to fight this menace: separate “no cell phone” lanes. Yup, having given up on appealing to people’s common sense, the government figured it’d be easier to just herd them into separate walking paths like sheep. There’s no word on whether they officially call it the “idiot watch where you’re going before you murder us all” lane, but I’m going to go ahead and assume that’s exactly what it’s named. How bad does a problem have to be to warrant this? Were there daily casualties because of distracted texting? Did people just aimlessly wander around like Roomba robots and bump into each other? In any case, you have to commend the city for going out of their way to solve an issue. And surely a plan that relies on having your sign read by people so absorbed in their phones that they literally walk into water fountains couldn’t possibly fail. Right? I just cancelled my smart phone contract a couple of days ago. I just couldn’t hang with all you texters and tweeters and such. I gave it up. A cell phone lane for walkers seems a bit extreme but then it is China where technology is probably more dense than anywhere else. I’m sorry my comment seems so intellectual and not at all funny. The phone fog in my brain has been lifting and I’m still recovering…. Cellphones are how our governments, run by lizard people from another galaxy, control our thoughts and behavior. I say good riddance! Banish that phone fog to whence it came! That made me chuckle warmly. And I needed a warm chuckle. Damn, I was kind of going for a sizzling guffaw, but I’ll take a warm chuckle too. I’m not picky. I just could not work myself up to a sizzling guffaw that day, I will try harder next time. Trust the Chinese to come up with a crazy idea like that. I might be a touch paranoid, but I suspect the smart-phone lane benefits from some high-tech gadgetry that allows their great leaders access to the messages. Looks like you, sir, can teach the Chinese government a thing or two about advanced spying techniques. Unless that’s literally what they’re doing already. I’m an old woman…so I rarely text, and don’t get texts either. I am glad someone is trying to herd these texting fools out of my path…now where is the walled texting lane on the roads, so they can play bumper cars with each other? Ha. I’m sure the walled version is only a few months away. This one’s clearly working so well. Bizarre way to try to deal with the problem. As for the woman who fell in the fountain, I believe she sued the mall for having an unsafe environment (unless that video is of a different woman). How ridiculous. I guess the moral is, if you do something idiotic, feel free to sue. Yeah I do believe I’ve heard about that. You often hear these stories about people suing others for their own stupidity. Hey…why not? I’d be a billionaire if I could pull that off!